Knee pain is a huge sufferance, especially for elders. During the aging process, bones and joints start to lose their strength and finally end up with debilitation. The final option to get relieved from the distressed pain is Knee Replacement Surgery or Arthroplasty. Knee Joint Replacement is an operative procedure to resurface the damaged knee due to arthritis. Either plastic parts or metal is utilized to cover the knee joint bones with a kneecap. 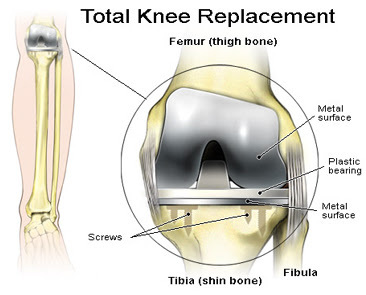 Knee Replacement Surgery is recommended to a person who has a severe knee injury or arthritis. What are the affecting factors of knee joint? Osteoarthritis is a kind of degenerative joint disease. It mostly affects the adult and older people. This condition may cause a break in the joint cartilages and adjacent bones in the knee. Rheumatoid arthritis is an inflammatory condition of the synovial membrane. It results in synovial fluid inflammation which might lead to pain and stiffness. Traumatic arthritis is caused due to severe injury which may damage the knee cartilage. The objective of the Knee Replacement surgery is to resurface the damaged knee joint parts and relieve excruciating pain. Before the Surgery, the Orthopedic Surgeon will analyze the patient’s medical history, do the physical examination in order to evaluate the strength, stability, and range of motion of the knee. X-ray / CT/ MRI will help him to analyze the severity of the damage. How is a Knee replacement surgery performed? The Orthopedic Surgeon will make an incision up to 10 inches long in the affected knee area. Then, he will remove the damaged surfaces and resurface the knee joint with the prosthesis. Though plastic and metal prosthesis are available, most commonly used is a cemented prosthesis. This cemented prosthesis is attached to the bone with surgical cement. The surgeon will bend and rotate the knee to ensure its smooth functionality before closing the incision. Then, the incision is closed with staples or surgical sutures. To remove the fluid in the surgical site, a drainer may be inserted. Finally, a sterile dressing is done. The knee joint replacement will be performed about 2 hours. The next day of the surgery, a physiotherapist will teach some knee exercises to the patient. Doing such exercises will relieve the surgical pain, stiffness, and improve the mobility of the knee. The patient can start his normal works after 6 weeks. However, he is advised not to involve with high-impact activities. The patient will be prescribed antibiotics, painkillers and vitamin tablets for certain days or months. Then, he shall go for the follow-up as advised. Shree Meenakshi Orthopedics & Sports Medicine Clinic is a well-renowned Orthopedic Hospital New Delhi who performs all kind of orthopedic surgeries. Dr. Raju is a famous Orthopedic Surgeon Delhi who performed a number of Knee Replacement Surgery New Delhi successfully.